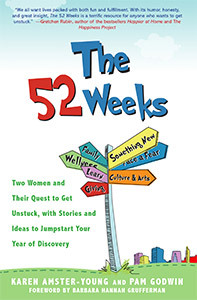 Q: How did we get the idea for the 52 weeks? 52: We were out having drinks one night and found ourselves complaining to each other: We both felt stuck! We had checked off many of our major life goals -— career, husband, children, friends -— but lost momentum. We came up with a plan and challenged ourselves to try one new thing every week for a year -— from test-driving Maseratis to rock climbing to dance lessons -— and to blog about our weekly efforts and experiences. Q: How do we know each other? 52: We met when our daughters were in preschool together! They are now in middle school! Q: Did we each have a favorite “52” activity? 52: It was less about a “favorite” 52 to-do and more a sense of accomplishment each time we checked something off. The blog just helped get us going again! Q: How is the book different from the blog? 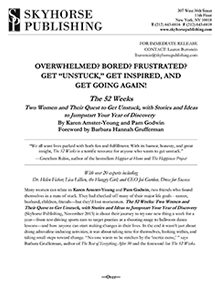 52: The book is a combination of our personal stories that were on the blog and advice and tips from many experts. The experts were an important part of the book. 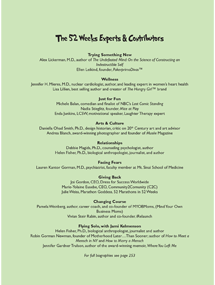 We interviewed many, including doctors, CEOs, therapists, artists and even a poker diva! Each chapter begins we some of our original blog stories but then follows with first-person narrative, anecdotes from both of us and then expert advice. There are also inspirational quotes and a Next Steps section for readers. The book also features some worksheets and other tools -– including lists of ideas for jump-starting every area of your life. 52: Our original 52 challenge ended quite a while ago, but moving forward and reaching goals – both big and small – is really a lifelong process. We hope, along with our experts, we continue to inspire people to start their own 52-week project! Workshops, other products — there are many possibilities we are talking about. 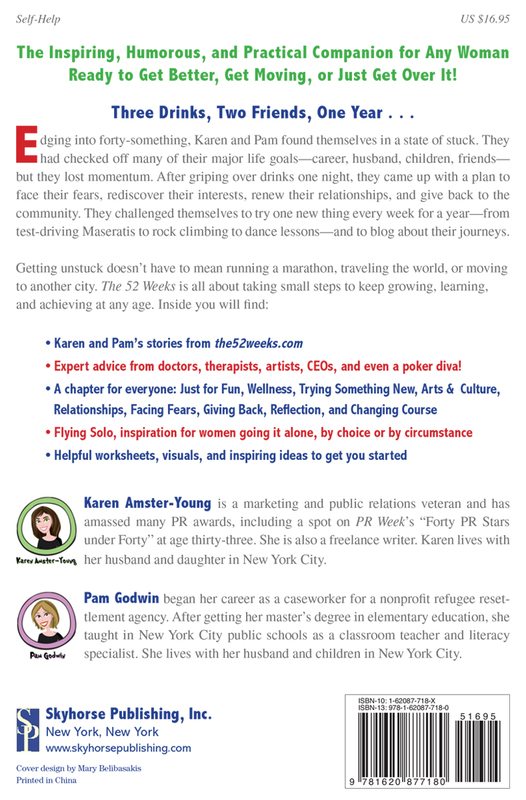 Karen Amster-Young is a marketing and public relations veteran and has amassed many PR awards, including a spot on PR Week’s “Forty PR Stars under Forty” at age thirty-three. She is also a freelance writer. Karen lives with her husband and daughter in New York City. Pam Godwin began her career as a caseworker for a nonprofit refugee reset­tlement agency. 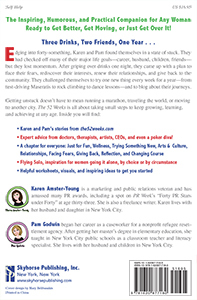 After getting her master’s degree in elementary education, she taught in New York City public schools as a classroom teacher and literacy specialist. She lives with her husband and children in New York City.